Today is my last day in Paris. How do these trips always manage to fly by so quickly? We were fortunate to have gorgeous weather for our entire trip, minus today. It’s rainy and cold. C’est la vie. With no plans, we just started wandering around this morning before the impending deluge. Many shops and restaurants remain closed for the August holiday break, but thankfully, a few of my favorite cooking shops and patisseries were not. I made my way to Rue Montorgueil, right by the apartment we rented last time. There, I purchased boxes of tiny macarons at Stohrer, one of the oldest bakeries in Paris. One box is a gift for the flight crew tomorrow, and the other will be coming back to Texas with me. The main reason for heading over to that part of the city was because I wanted to purchase a lame (pronounced “lahm”), which is the tool that’s used to score the top of baguettes. This is just in case I decide to try my hand at baking them in Houston. I knew just the place to find it. E. Dehillerin! And, I was pleased to find it open. Bonus! It took me awhile to find the lame, which was literally under my nose in the first place I thought to look. But, in wandering around trying to find this little gadget, I also found two whisks in varying sizes that I couldn’t live without. So, I purchased my new cookware and headed out to G. Detou nearby. There, I was looking for powdered food coloring that’s used to make macarons like the fantastic one pictured above. This ingredient is not cheap, and since I’m not in the business of making many batches right now, I settled on one. A chose a marigold yellow color that I’m hoping I can play with to achieve a variety of sunshiney colors. I snaked my way back to the Marais in the rain, and happened upon Pierre Hermé, the rival patisserie to Laudrée (if there is such a thing here in Paris). I just wanted a small taste of their salted caramel macaron, but being the excellent vendeuse that she was, the shop attendant talked me into the monster-sized one. And it was worth every damn calorie. For me, the best part about today was having no agenda and navigating around purely by memory. I love walking past a shop or restaurant and having a memory come flooding back. It happened today when we passed Costa Coffee (I’ll never forget ducking inside one in Budapest to escape the cold that was so harsh, I couldn’t even type on my phone), and again when I passed a boulangerie near the Centre Georges Pompidou. I thought, ‘I remember buying a baguette somewhere around here and walking around eating it.’ I looked left, and sure enough, there was the bakery in the same spot. I can’t even remember which trip that was on, and that’s happening with more frequency as I visit Paris more often. Memories get jumbled up, but the internal Thomas Guide is becoming sharper with every visit. So, as is typical of the day before leaving an amazing city, I’m already plotting my return! 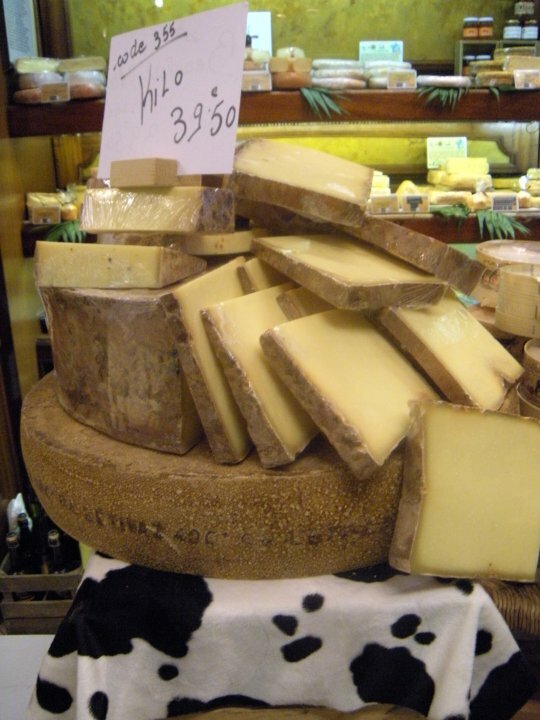 Posted in Cooking Class, Culinary, Culinary Hopscotch, France, Paris, Travel, Uncategorized. Bookmark the permalink. I never imagined it would be this cool in Paris in the summer. There’s a crispness in the air that seems better-suited for autumn, but it sure is a welcomed reprieve from the heat and humidity in Texas. After dumping my belongings at the apartment in the Marais, I went for a walk to Ile St. Louis. There are a number of great cafés, and I figured it would be a good place to line my stomach before my baking class nearby. Soup à l’oignon gratinée and a glass of rosé. It’s becoming my welcome répas each time I visit. My class started promptly at 2:30pm, and three-quarters of us managed to arrive nice and early. That led to a prompt start, with two ladies straggling in while we were elbow-deep in flour and poolish. We were as lost then as you likely are now regarding the word, but we mimicked what Chef Eric was doing nevertheless. More on poolish in a bit. I paired up with a really nice girl named Kate, who ironically used to live in Houston. Her husband’s job (he’s a geologist to the oil industry) moved them from the land of humidity and queso to Paris, so here’s hoping Brady and I might follow in their footsteps. Between bouts of kneading our dough correctly and sometimes not, we swapped stories about Houston, restaurants we both like there, etc… It was kind of like taking the class with a friend. So, what goes into a these bread swords you see sticking out of fashionable purses around Paris? Nothing more than bread flour, salt, water and yeast. Oh, and elbow grease, but that’s an unspoken addition. It really wasn’t all that difficult to create the baguettes, but you do need counter space and a willingness to demolish a tidy kitchen. Baking is messy. There are no two ways about it. Something else that you will need is a kitchen scale. Like Chef Diane from my macaron class in November (who I saw briefly today), Chef Eric also drove home the point that weighing your ingredients is the way to go. Note to self: purchase a kitchen scale. You’ll need it to create the poolish, a starter that’s made three to 18 hours ahead of time to jumpstart the fermentation process. It’s nothing more than bread flour, water and fresh yeast, but this step makes a marked improvement in the bread’s flavor. Perhaps most important of all, though, is the double proofing process where you allow the dough to rise after kneading it, and then again after it’s formed into a baguette shape. The baguettes will double in size during this process, so if it’s twice as big as when you started, you’re on the right track. 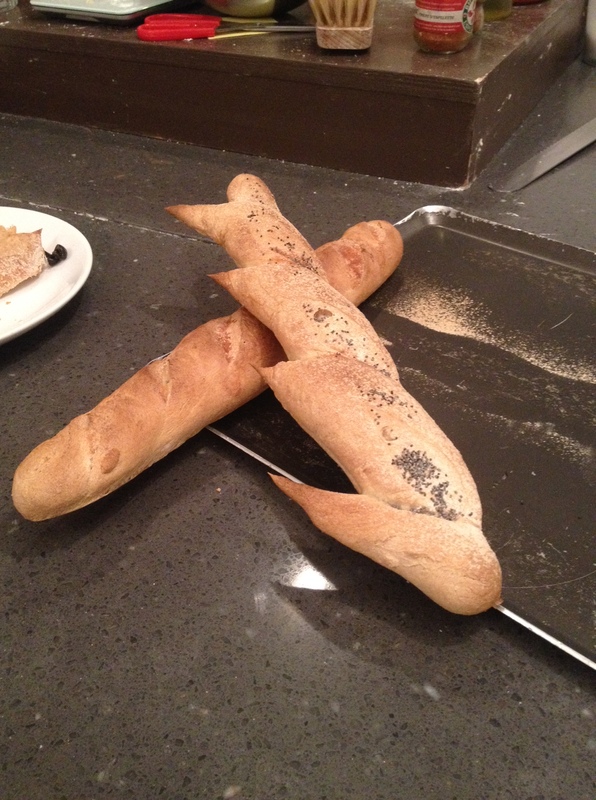 It’s also important to score the baguettes with a razor or small tool, which allows steam to escape. Most bakers have a unique score for their baguettes that is likened to an artist’s signature on a painting. I’m not a baker. I repeat: I’m not a baker. I don’t like to measure, I don’t have an egregious sweet tooth, and I certainly don’t have the patience or gadgetry that’s required of most baking projects. But that doesn’t mean I can’t appreciate the craft, especially something like freshly baked French bread. 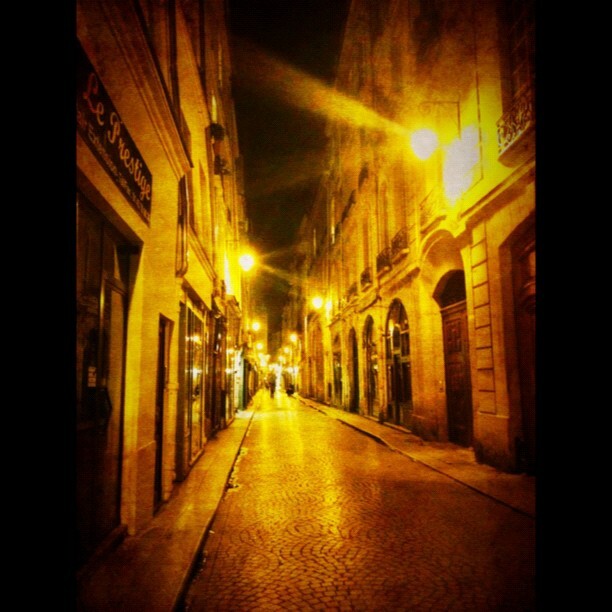 It’s one of the best parts about roving the streets of Paris. A major takeaway from this class was that we cooked in normal, convection ovens. The kind you would find in any home. A critical aspect of the baking process is steam, which can be achieved by tossing a few ice cubes into the bottom of the oven or by using a spray bottle intermittently. Outstanding tips that I likely would not have otherwise thought about! That’s all for now. Another great culinary experience in the books! If you’re ever in Paris (or any of the places I’ve traveled with Culinary Hopscotch) and want recommendations of cooking classes or other culinary adventures, please let me know. 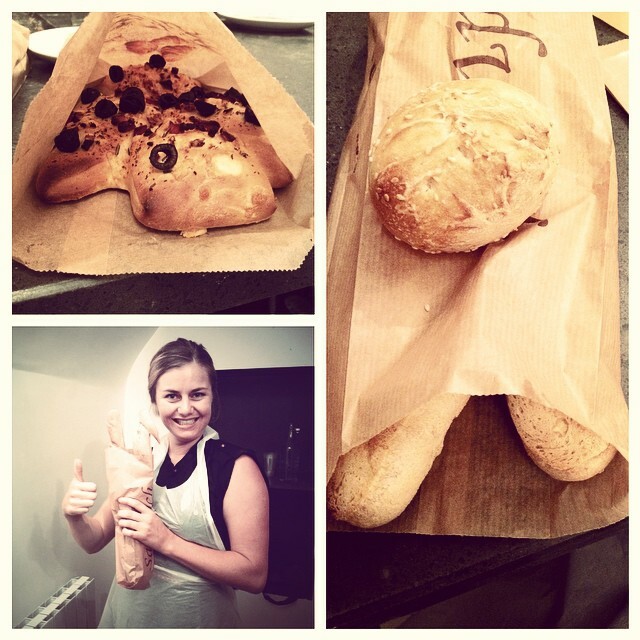 Posted in Cooking Class, Culinary, Culinary Hopscotch, France, Paris, Recipe, Travel and tagged baguette, baguettes, bread flour, Paris. Bookmark the permalink. In preparation for my trip to Paris, I packed “My Life in France” by Julia Child and brought it back east in my crew bag. I figured I would re-read it on the jumpseat to drum-up excitement for my trip. I read the book prior to conceptualizing Culinary Hopscotch back in 2009, which was some time ago. I don’t know why I’ve never thought to read it again. In just one short chapter (the introduction, actually), I’m amazed at the many similarities and connections I now see between the two of us. By no means is this comparison meant to be culinary in nature. First off, for those who follow my #crewlife tales, you’ll remember that I just visited the Smithsonian exhibit of Julia’s kitchen in Washington D.C. a few days ago. The layover was planned, but riding bikes to the National Mall with my crew was not. As luck would have it, we all split up and went our own ways, finally giving me the opportunity to go see this exhibit. It also happened to be Julia’s birthday that day, which I didn’t know until after the fact. The kitchen is an exact replica of the one from Paul and Julia Child’s Boston home, the city where I spend half of my time flying for JetBlue. Secondarily, Julia is from Pasadena, California, just up the road from where I grew up in Newport Beach. Two California girls, navigating Boston’s unique mixture of culture and unpredictable weather. But perhaps most interestingly, she penned “My Life in France” in Montecito in 2004, just down the road from where I attended college at UC Santa Barbara. I graduated two years prior. I’m shocked that I never ran into her while babysitting for a family in her neighborhood, or at La Superica, her favorite hole-in-the-wall Mexican restaurant that is adored by college students and famous foodies alike. More than anything, however, our love of France– Paris, specifically– is what strikes a chord with me. There are so many ways to see Paris, but in mine and Julia’s opinion, the City of Light is best viewed through a culinary lens with a fork always at the ready. While writing this, I was shuttling people back and forth between the Northeast and West Palm Beach, an oft challenging crowd for those in the know. I wasn’t about to let them get to me. Tonight, I’ll be boarding a flight to Paris. 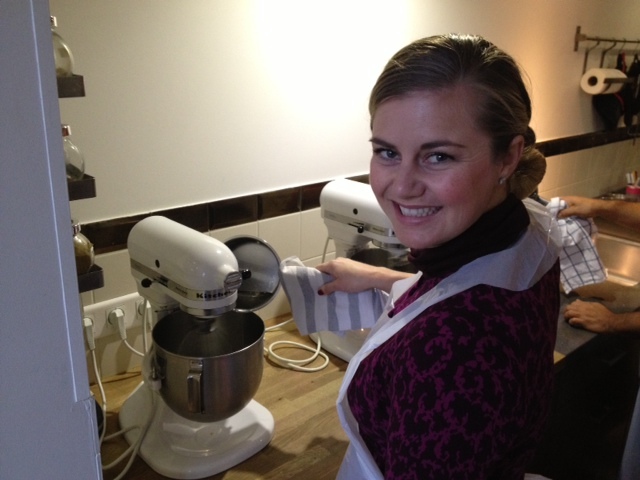 And on Thursday, joining a baking class where I’ll learn to make baguettes and other doughy delicacies in a home oven. You can keep the palm trees and the beach; I’m heading to where the magic is made in café kitchens, patisseries and in a small hole-in-the-wall Mexican restaurant along Canal St. Martin. 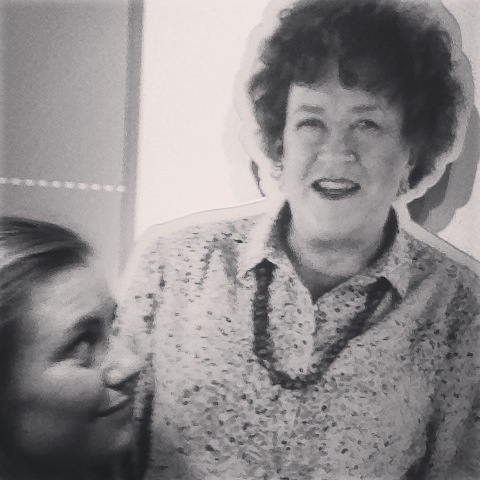 Posted in Cooking Class, Culinary, Culinary Hopscotch, France, Paris and tagged Julia Child, Paris, trip to Paris. Bookmark the permalink. 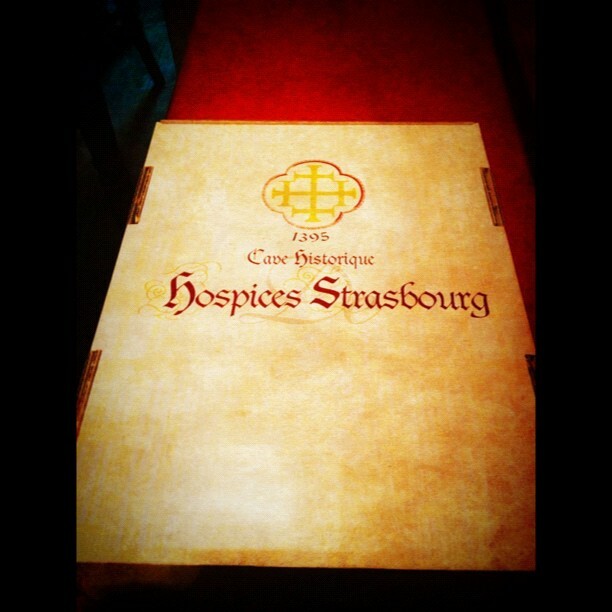 Posted in Cooking Class, Culinary, Culinary Hopscotch, France, Paris, Travel. Bookmark the permalink. 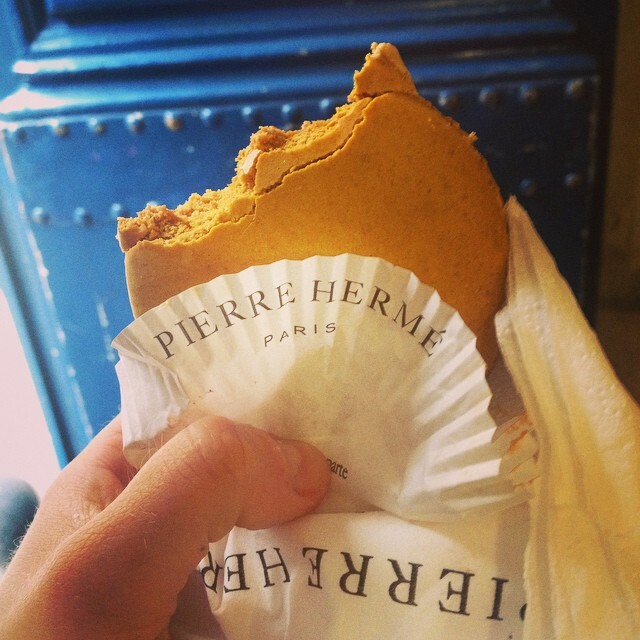 In Paris, patîsserie shops are a dime a dozen. Unlike in the U.S. where the word “bakery” encompasses all things baked, in France, breads, croissants and the like are found in boulangeries, while patîsseries are where you will find more luxurious desserts like tartes, cakes and the famed macaron cookie. If you’ve had the good fortune to gaze into the window of a Parisian patîsserie, the bejeweled arrangement of macarons is enough to catch your eye. They say you eat with your eyes first, and these cookies have a way of stealing the show both visually and in taste. In Paris, macarons are everywhere, but you will want to know where to go (Pain du Sucre, Stohrer) to make sure you’re getting your Euros worth. The good ones are worth the bite-size price of admission. Selecting your macaron might be the biggest challenge of all though, because the flavor profiles are endless. Sweet, savory, a combination of the two. Picking just a few and having them tossed into a bag is a far cry from the satisfaction you get from filling up a box with all of the different colored cookies. It reminds me of picking out a dozen donuts with my dad at Winchell’s when I was little. For me, the salted caramel variety (typically made with fleur de sel) has proven particularly irresistible, and fortunately for my mouth and unfortunately for my waistline, we found an authentic patîsserie in Houston that would make the bakers in Paris proud. In fact, we took a box along for the flight attendants working our flight from New York to Paris in the hopes of being moved up front. It checked-in full, sadly, but they did supply us with our own box of wine to leisurely serve ourselves over the Atlantic. But back to the macarons. Getting the Culinary Hopscotch train back on the tracks was much easier on this trip with many cooking classes to choose from. We spent a week in Paris and took day trips this time, so it was easy to set aside an afternoon to learn more about these cookies. I don’t fancy myself a baker. At all. And in fact, I’m not a huge fan of the practice. It’s the measuring. And while I appreciate the science behind baking, I’m much more of ‘a pinch of this, a dash of that’ girl. Please note: there is no room for this methodology with macarons. For something so small, there are numerous steps that go into making these cookies, but there isn’t much to them ingredients-wise. Right off the bat, I learned that they are gluten-free, which is great for sweets lovers who need to steer clear of wheat. And it’s the unique combination of Italian meringue (egg whites, sugar and water) and almond meal mixed with confectioners sugar that give the delicate little cookies their smooth exteriors and feet in the oven and allow you to fill them with almost anything you can imagine. I love admiring my macarons before eating them; to look at the sheen and the smoothness of the shell. And now that I know what goes into this process, I believe my admiration is justified. Cracking is one of the biggest problems many bakers face while making macarons, and there are a variety of things that can cause this to happen. An oven that is too hot. One that is not hot enough. Improper sifting of your almond meal and confectioners sugar. Not incorporating the ingredients properly. And perhaps the biggest enemy of all, moisture. Our teacher pointed out that we would be using powdered food coloring to mix into our batter for this very reason. Since some of the color bakes away in the oven, she encouraged us to be generous with the food coloring if we wanted to achieve richer colors. 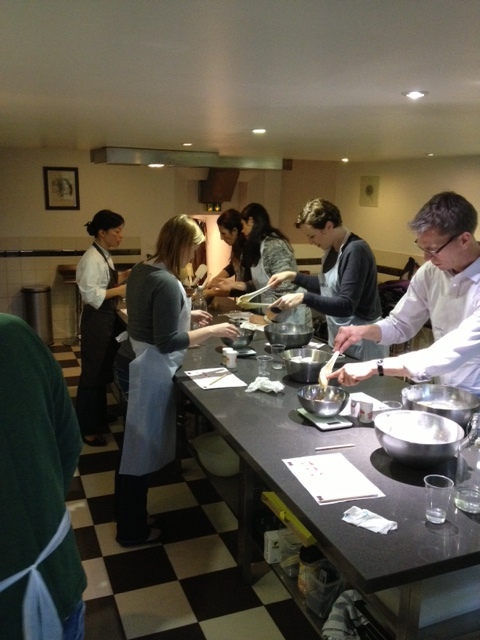 We started by creating the fillings for our macarons so they could set-up in the fridge while we worked on the shells. In groups of three, we created a white chocolate-raspberry filling, a pistachio filling and a dark chocolate-orange filling (ours). Once done, they went into the fridge until we needed them again. At this point, we started on the macarons. We heated up the sugar and water to 115 degrees Celsius, flipped on the KitchenAid mixers to get the egg whites going, and when the sugar reached 118 degrees Celsius, we gradually added it to the egg whites, allowing them to mix until the bottom of the steel mixing bowl was comfortable to the touch and they formed stiff peaks. In the meantime, another member of our team worked on sifting the almond meal and confectioners sugar together, and then added in egg whites and the powdered food coloring. 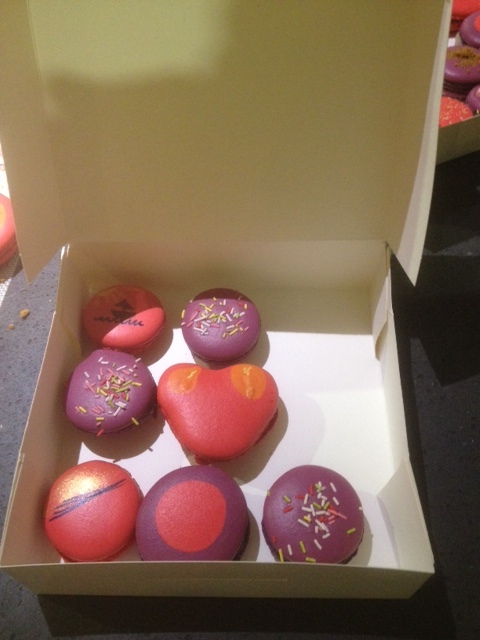 Each team selected two colors for their macarons, ours being a royal purple and fierce magenta-red. Once the meringue was ready, we incorporated it into the colorful batters in three batches (mixing twice, and folding on the third and last go) before filling pastry bags with the mixture. Regarding baking, a Silpat is going to be your best friend because macarons tend to stick and ripping them off a baking sheet will undoubtedly cause them to crack and you will lose the little footing. You can try parchment paper, but a silicon mat will work the best. All you need to do is to pipe small circles about the size of half-dollar onto your baking sheet, giving the macarons a bit of space to expand in the oven. They cook for about 12-15 minutes depending on your oven, and require time to cool before you remove them from your baking sheet. If your macarons are properly cooked, they should remove from the Silpat easily. From here, it’s rather easy. You match-up different shells of similar size, and then pipe in a small amount of filling, twisting as you go to allow the delicious filling to reach the edges. Regarding storing them, freshly made macarons will need to be placed in the fridge for at least 24 hours to allow the flavors to come together and help them to set. But they will keep for sometime in the fridge, and you can freeze them for up to three months as well, including any leftover batter or filling. To serve, bring the cookies out of the fridge and allow them to come-up to room temperature. You can decorate macarons both before and after they’ve been baked, the former with things like shredded coconut, crushed speculoos cookies, sprinkles and the like, and after with pastry dusting powders or edible pens. Posted in Cooking Class, Culinary, Culinary Hopscotch, holiday, Paris, Travel. Bookmark the permalink. Despite almost not making the CDG–JFK flight last night (overselling is such an attractive practice), I’m back in the states and already down in Florida. JetBlue didn’t waste any time assigning me a trip. I landed and had a 5:00 a.m. report. Oh well, I commuted in from Paris for work; things could be worse. Paris was like an old friend I hadn’t seen in a while. With no real agenda to speak of while I was there, I kind of just walked around and did whatever I fancied. While I never got around to taking any cooking classes, I did manage to eat my way through the city and visit some restaurants that have been on my list for some time, and one that is just a perennial favorite. Take note: Verjus, Reed, and Fish La Boissonerie are three restaurants you shouldn’t miss in Paris. Just don’t. Take the time to make a reservation and find them, and then sit back for a culinary fireworks show. And yes, if you read my last diatribe, I did make it to Fish on my last day for lunch. Tuesday, I spent the day in Strasbourg, which was an easy and excellent day trip from Paris. The TGV whisks you there in two hours, and it was this amazing collaboration of French and German influences, almost like they had a child together. I had lunch in an Alsatian restaurant (Le Gruber) that was outfitted in what looked like Bavarian décor, yet, I was ordering my food in French. It was great. I also managed to locate the historic wine cave under the hospital, which was something I had read about prior to arriving. While I wasn’t able to taste any wine that day, they do have a wine shop, so I procured three Alsatian wines (a rosé, a pinot noir, and a Chateauneuf du Pape) that I lugged back on the train to Paris, and then on the plane to the U.S. Despite carting my flight attendant costume with me, I wasn’t permitted to bring the wine through security with me. So, I checked the bag and prayed I wouldn’t be met with a soggy suitcase tumbling down the luggage belt like it was on a water slide. Lucked out there. So, what’s up with this whole non-rev business? Well, for one, I now get why people tolerate the measly flight attendant salary. I paid $92 for my ticket over (JFK–LHR) and was put in first class on American. No, not business. First class. Pajamas, champagne and all. On the way back, the ticket was more expensive (maybe $150), but Air France was gracious enough to give me Premium Economy, which is almost like a junior business cabin. Yes, flying standby is not for the faint of heart, but if you are flexible like every good flight attendant is meant to be, you can see the world for pennies on the dollar and giggle about how much the person sitting next to you spent. I did that. I don’t have any plans for my next trip (yet), but doubt it will be long before there’s something on the books. Any suggestions? Posted in Airlines, Culinary, Paris, Random Ramblings, Restaurants, Travel. Bookmark the permalink. Order Up: London, Paris and Strasbourg! To celebrate making it past the six-month probationary mark with JetBlue, I’m heading to Europe next week! At least I think I am. This will be the first time I tempt the non-rev’ing Gods internationally, so I’m hoping I can get a seat on one of the three non-stops from JFK to Heathrow. Then again, I’m just hoping I can get back to JFK for work at this rate. With Europe involved, I will find a way! It always amazes me how quickly my trips come together. Brady encouraged me to go last Thursday, so I contacted my friends in London, rented an apartment via Airbnb in Paris, and bought train tickets to Strasbourg for a day trip. I’m also taking the Eurostar/Chunnel for the first time, and I can’t wait for the experience. It only cost a bit more to book in first class, so I figured, “Why not?” They give you a three-course meal, there’s free wi-fi so I can use my phone or laptop, and the seats are bigger. Perfect. As far as culinary things go in Paris, I’m booked in for two great dinners at Verjus and Reed, and I’m definitely visiting The Gallery Museum Baccarat this time. Evidently, it’s a sight for sore eyes, and there’s a particularly eye-catching bathroom that shouldn’t be missed. I’ve booked myself in for lunch there too at the Crystal Room restaurant. I’ve been on the hunt for cooking classes, but haven’t been able to match anything with my schedule. If you’re up for a hilarious story regarding a cooking class inquiry gone awry, you can read about that here. A word of advice: learn the difference between “forward” and “reply” when it comes to business emails. There’s still time for a class to work out, but if not, there are dozens of other culinary-related items I can get myself into. You can make a day of snacking on delicious cheeses like the ones in the photo, chatting with bartenders about wines, and eating a Berthillon ice cream cone as the world walks by. I’ll report back as the trip rolls on. Posted in Airlines, Cooking Class, Culinary, Culinary Hopscotch, London, Paris, Travel. Bookmark the permalink. Jump on the Culinary Hopscotch Bandwagon!